Find and compare the best prices from a range of well known car rental companies at Groningen Airport. This is a free to use facility, enabeling you to book direct with the company quoting the price. 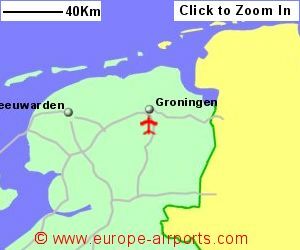 A bus service links the airport with Groningen every 30 minutes during the week and every hour at week-ends. Groningen airport has 2 bars/restaurants, shop, cash machine, childrens play area and WiFi Internet access. There is also an hotel, L'Avion, on site, with conference facilities. 228,000 passengers passed through Groningen airport in 2017.